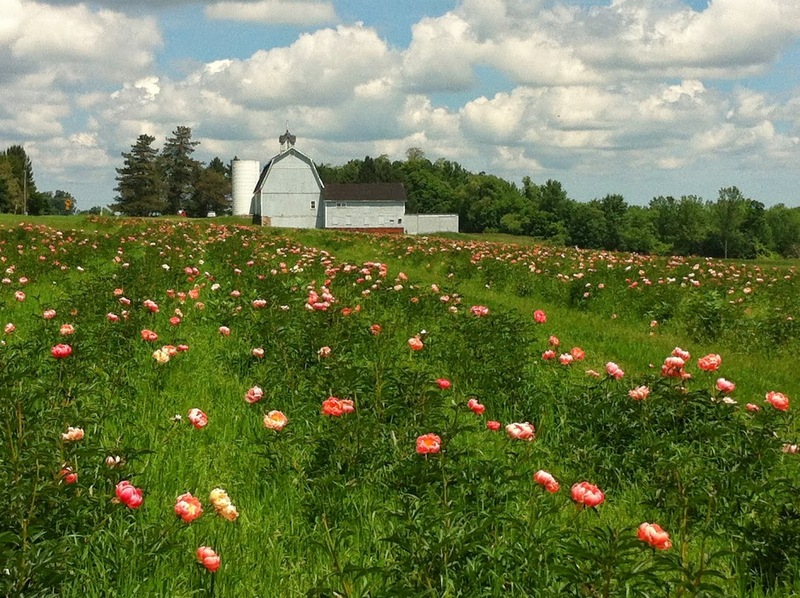 This is a fun story from June 2013 when we traveled to Mr. Bee’s 35th college reunion. Enjoy! Hot Topic: How much I have eaten in the last nine days. We went away for Mr. Bee’s 35th college reunion in Geneva, New York. It is a trip he had planned back in September before we knew our lives would dramatically change three weeks ago with the death of Earnie. For a brief moment I didn’t think it would be appropriate to move ahead with our travel plans. But, it was really important to Mr. Bee and, now that we’re home, I’m glad we went. The weather was cool and beautiful. I had no idea that at home (we live near the equator in Texas) it was 100 degrees. In upstate New York it was 60 degrees. The accommodations at the B&Bs Mr. Bee reserved were just what we needed. The first place was in Jackson, TN. 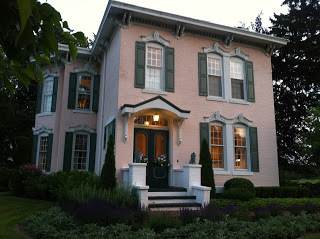 It was a home built in the 1800s and restored as a B&B. 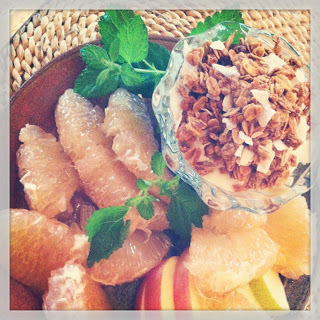 They prepared a lovely breakfast for us each time. 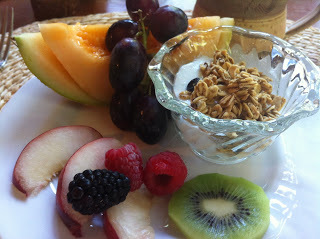 Starting with fruit, then either eggs or French toast (French toast is a theme you will find). Next stop was the Winfield Inn in Ashland, Ohio. This wins the award for the most beautiful B&B I have ever stayed in. Also built in the 1800s, the owners fully restored the home into a Georgian jewel. Each evening came with a turn down service of our bedding with a tray of chocolates, cheese and fruit. First morning, French toast stuffed with orange marmalade and cream cheese. Second morning, Eggs Goldenrod. Side story: When I was little, Earnie dropped me off at pre-school on those occasional days when she needed to get work done at Daddy’s shop. I am not sure what the school was called, but all I know it as is Mrs. Schmidt’s school. 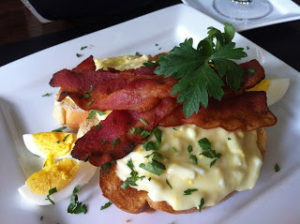 Sometimes at lunch, they would serve creamed chipped beef on white bread. Gag. Gag. Gag. That started my distaste for anything creamy on top of bread. Daddy said they served it during the war and referred to it as “S&^% on a Shingle.” Anyway, back to present day. I was a trooper and ate the Eggs Goldenrod. They were very tasty and a recipe I might try. 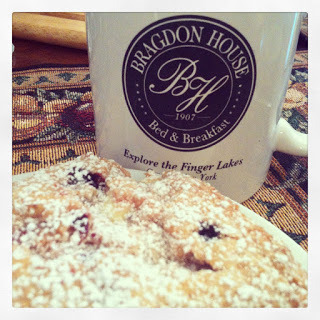 Finally, my favorite place we stayed was the Bragdon House in Geneva, New York. The home was right on the lake. The Innkeepers are a Mother/Daughter duo. They treated us like family. We’d sit on the porch in the evenings with wine and visit. We shared with them about Earnie and the whole time we were there they loved on us and treated us like family. 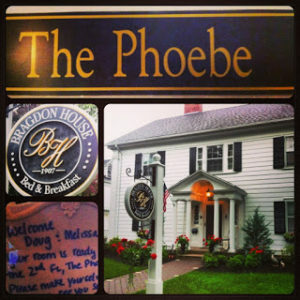 The room we stayed in was called the Phoebe. I’ve learned that in life, there are no coincidences. We stayed there four nights. The first day we had white chocolate raspberry scones and quiche. I ate the quiche so quickly I forgot to take a photo. 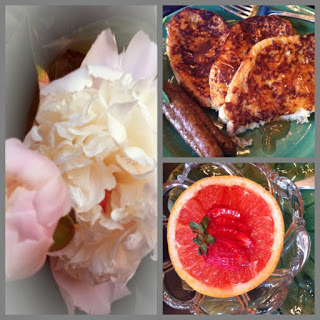 The second morning we had banana stuffed French Toast soaked over night in almond milk. Oh. My. The third morning we skipped breakfast because we ate at the home of the President of Hobart College. She served egg souffles that morning. 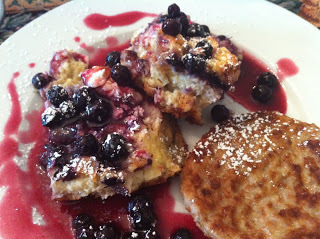 The last morning we had blueberry French toast. It is going to be hard to go back to my Cheerios and bananas. But, I’ll have great memories.